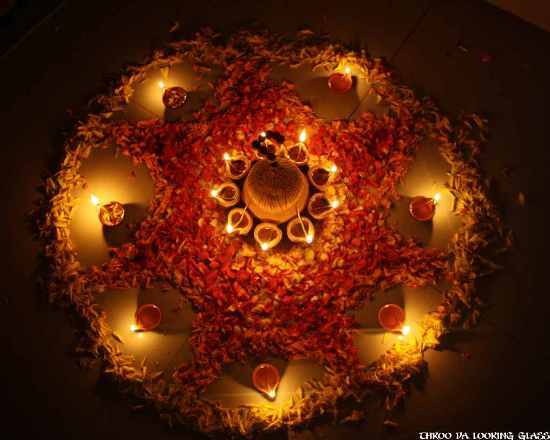 Diwali is one of the most wildly celebrated festivals in India. 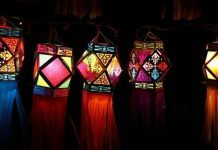 It’s a festival of lights, firecrackers and especially no one can refute the role of colours on this festival. Hindus celebrate this festival to applaud lord Lakshmi on her marriage to Lord Vishnu and on returning of Lord Rama to his house after 14 years of vanvas. In India, every house gets decorated with lights and colours on this auspicious day. 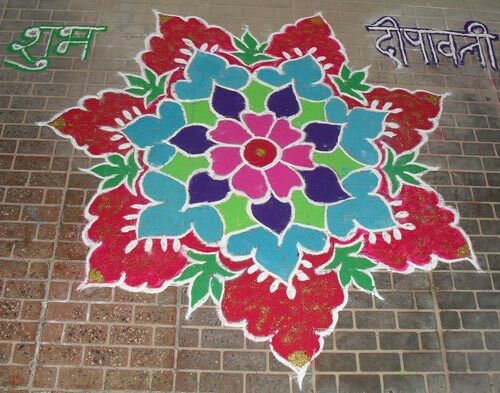 The entrance of the homes with rangoli Designs ( a combination of colours and flowers). So goddess Lakshmi enters the house to shower her blessings on everyone, the Hindu goddess of wealth. 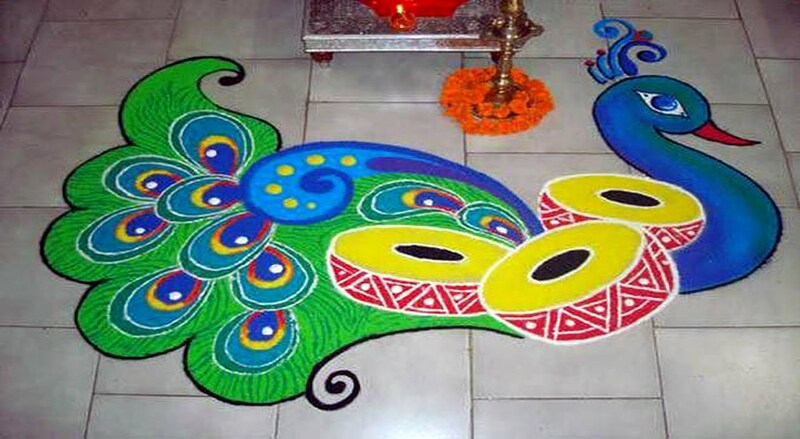 Making rangoli is not a cup of tea to everyone as it calls a certain amount of imagination, innovation, creativity and skill. It’s an artwork which is done relatively by women, who are talented, artistic in these kinds of work. 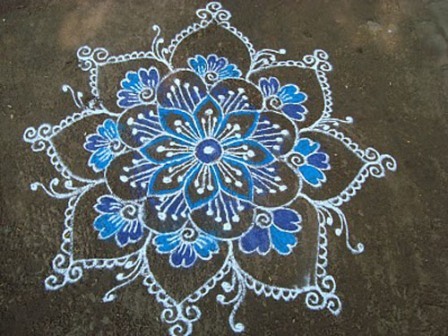 You too can do so and remark by drawing a beautiful decorative rangoli at your doorstep. It is a classic work of art yet modest gorgeous; one square base beautiful bright floral designs get drawn. The picture is painted with a smooth green grass, midnight black and bright colors and shades of orange and red. Here five lamps are harmonised beautifully to create a fantastic scenario. 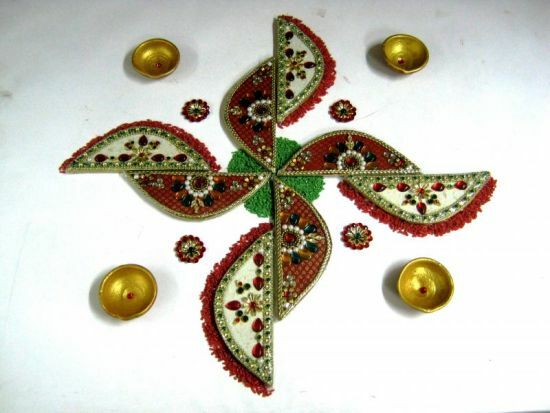 This is a beautiful design with triangular hearts made out by coloured threads and decorated with diyas on each corner. The base gets set by forming triangles by twisted coloured yarns and the candles are placed beautifully within the design. Another fantastic pictorial design, preparing the evening light show that this kind of semi-circle, in which the small half red tone, make a flower. Whitish colour is more significant dotted around. 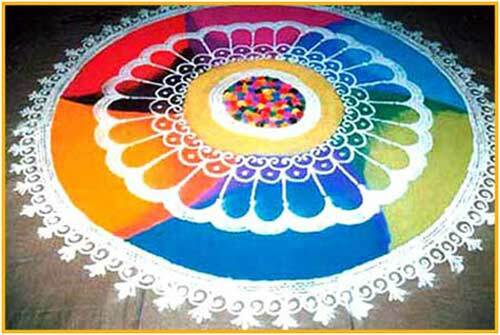 The rangoli rice or the coloured rice of green colour is in the middle, surrounded by a red hemisphere. In a darkened area the sparkling lights lit flowers and daisies will be more reflective create a heavenly look. For your front yard, there is a beautiful flower which is massive and massive to pluck. 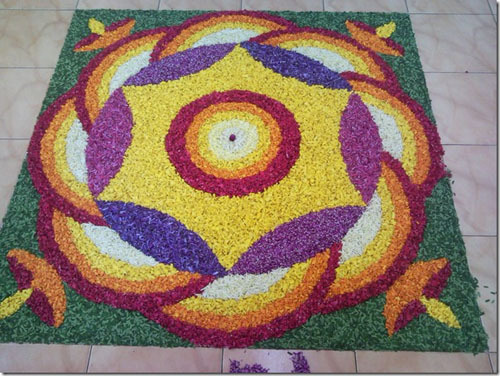 A design covering the entire yard wherein a simple flower, without complications created through rangoli colours. 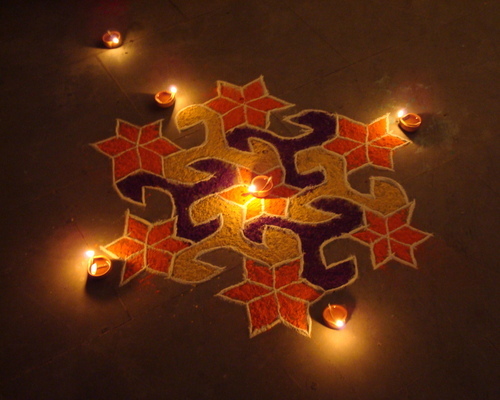 The petals alternately designed with orange, maroon, and white with lamps in between. 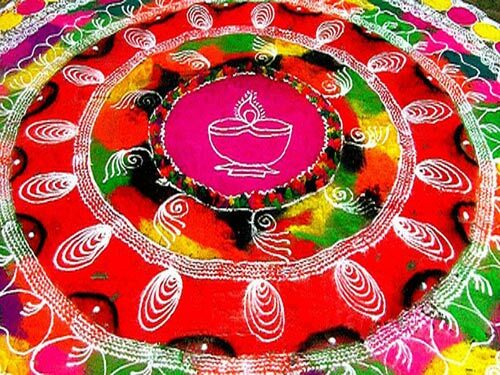 Here the design of rangoli is almost like a candlelight dinner, rangoli pattern. 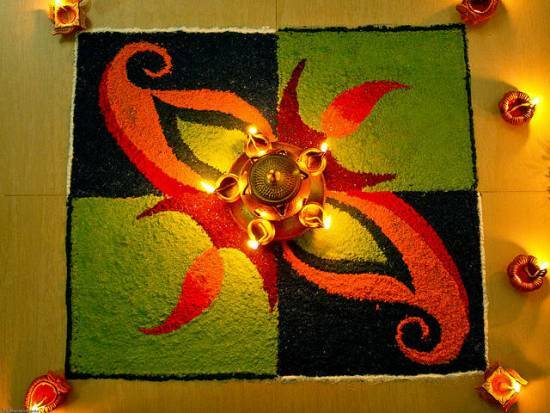 Rangoli design gets powered with beautiful twin light which brightens up the delicate area. The lamps appeared in the heart shape, while the circle in the centre of the pattern highlighted with the outlines and the artistic designs in between. Peacock is a magnificent bird its tail of gemstone flowering in Pride and Prejudice. 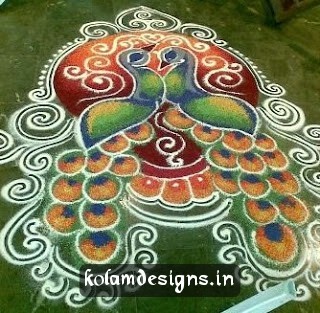 Here in this rangoli design, two peacocks facing each other infatuated with each other’s love. 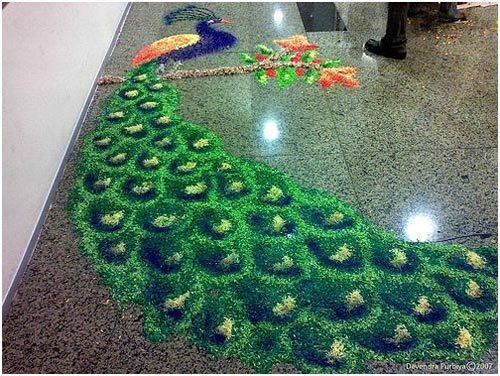 This rangoli design not only depicts the beauty of love but also hold up the beauty of feather tail. We all know our national bird peacock is one of the most beautiful birds all around. 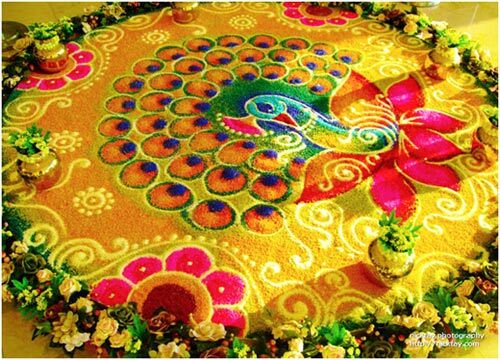 As the national bird of India, it is suitable; we will subsume it in our rangoli design while decorating the house. 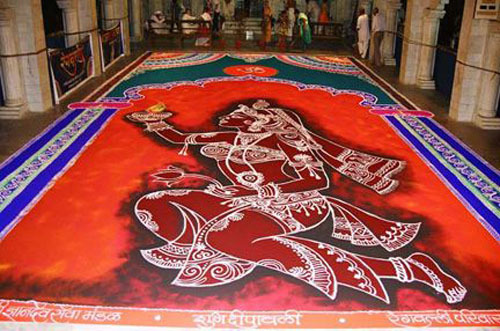 Here is one such rangoli design where the rear portray beauty is impeccable. A beautifully designed pattern enlighten with lights in a circle. The centre of the model is engraved with a flower while the surroundings are of a red wavy line. Although at night light show is here shown as the front porch latest designed for the day. A cool icy blue colour with a white exterior a beautiful floral design created. A rangoli design can by an abstract design made up by full lighting and lamps in a colourful way. A mixture of vibrant colours here, including red and sparkling blue and a floral pattern, has been created by the lamp structure. The design shows how not only bright colours are beautiful, but you also need simple and elegant appearance. The exterior lamps enlighten the pattern in a right way. Here, you can catch the women folk to work for the decorative eve. It is a bright yellow triangular shaped sunflower with a green outline, and the middle circle designed with a peacock feather with dull purple outlines. 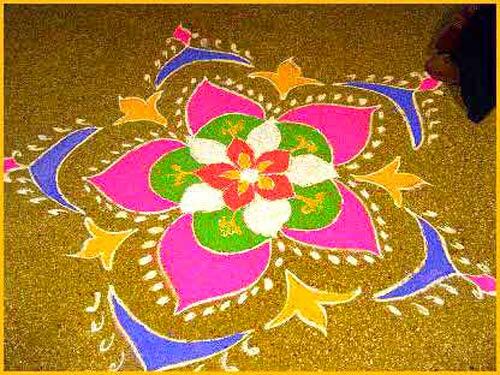 Rangolis are usually of same colours to make it something different here we used little glitter of bright, subtle colours, such as gold and coral red hue. The Inner circle looks beautiful in icy blue. This sparkle seems marvellous In the white marble background. Does your front yard look at the sky, if the design like this carved in the front of your house? Here is a national bird is looking beautiful in the vibrant colours. Beautiful looks of a peacock are exposed out in this golden yellow, orange and blue tone. a pleasing pattern made up of the most beautiful flower petals in a star shape with a lamp in between and in the corners to make it artistic and magnificent. 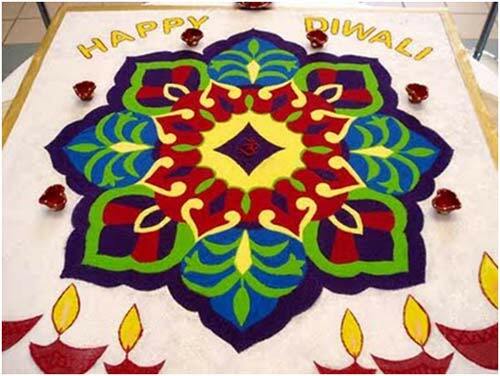 It’s a simple Diwali rangolis which you can see at anywhere, and also you can quickly try it at your home. These designs are effortless, but the choice of colours made it unique. 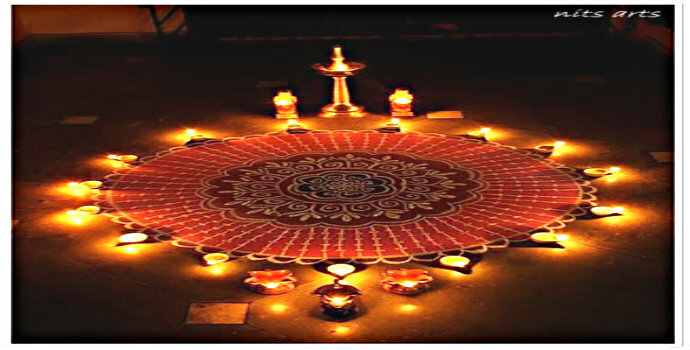 You can enlighten lamps in this pattern as per your wish at the centre as well as in the corners. 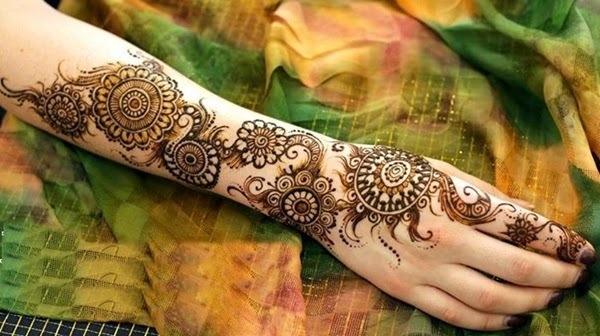 This design is little bit artistic need patience. You can make this design at your doorstep or in your living room. This semi-circular design is full of colours and shades. Here the use of red, blue, pink, green, yellow and white created a visual artwork. 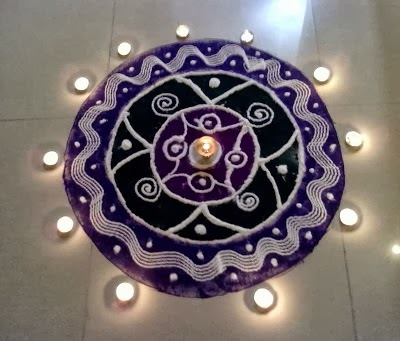 You can place lamps in the middle of the pattern or on the circular line to avoid the darkness on this Diwali. The vintage design and the combination of colours spread joy and happiness all over this Diwali. One more pattern which gives your entire home a unique appearance and an exceptional look. You can lighten lamps on the circular line or in the middle to create perfect blonde of magic. 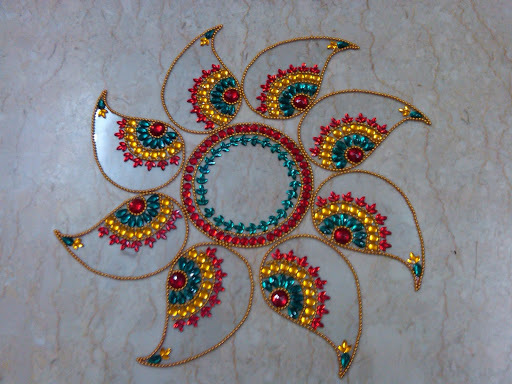 This is a latest beautiful rangoli design. The use of color is very limited in this pattern but lite of lamp turned it into a great one. 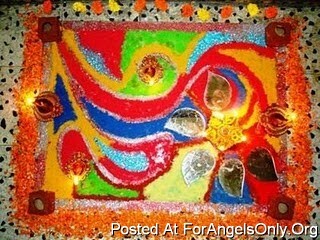 This rangoli is made of some beautiful flowers enlightened with diyas all over and in the middle. Orange and yellow colors are beautifully spreaded all over it. 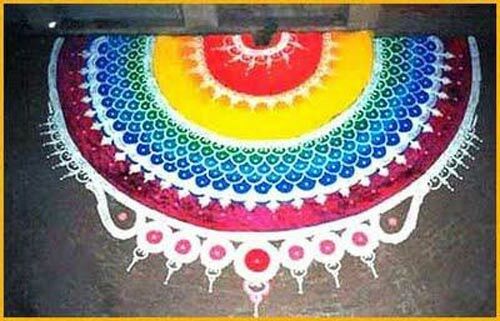 It is a latest beautiful rangoli design. The use of colour is insufficient in this pattern, but lite of lamp turned it into a great one. 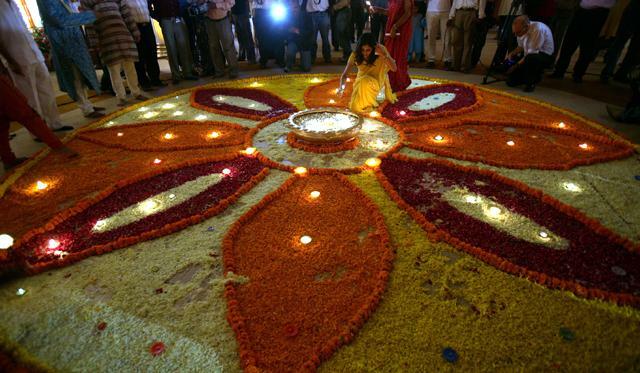 Rangoli made of some beautiful flowers enlightened with diyas all over and in the middle. Orange and yellow colours are beautifully spread all over it. This Diwali decorates your home by this exclusive pattern. These patterns do not need any artistry; they are simple and eye-catchy. Its vibrant colours make it more attractive to stand out. This type of designs fills joy in everyone’s mood. These designs are very refreshing to make your Diwali enjoyable and blissful. This design is very colourful and consist of flowers, petals and leaves. Combination and selection of right colors make it more beautiful. You can select any of the color to give it a new look. This design made of natural flower petals. 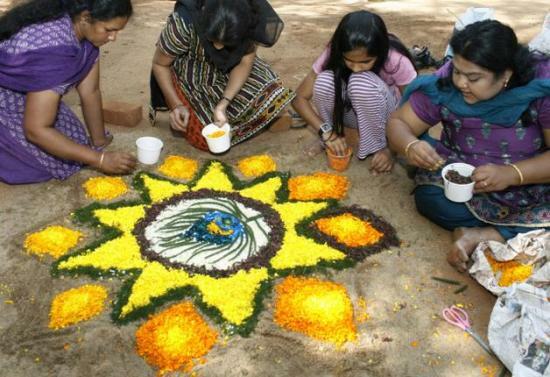 Here the selection of flower petals is essential which is to be chosen to match the spirit of festivity. It gives joy and happiness of festival and makes it more memorable. 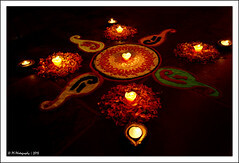 Here the diyas are also naturally made up of flowers, or you can also put original lamps at each corner. 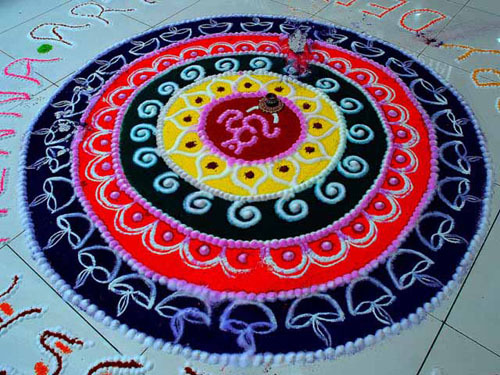 The middle of the rangoli graced by the name of lord shiva “om” with bright colours. 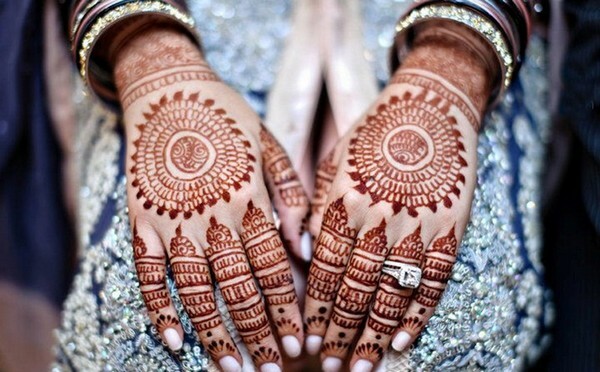 The outer most circle is designed by diyas very beautifully. 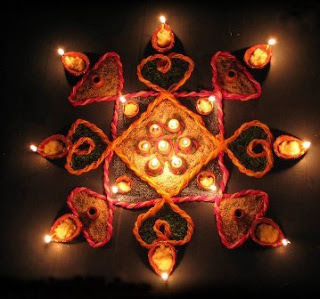 It is the best idea to decorate home on this Diwali. You can choose best colours to make it beautiful. The combination of red and black make this art traditional or antique. It is an artistic creation it features a lady with a Diya in her hand which is automatically a perfect representation of Diwali. Here we can use the word “surprising”. The colour itself represents its beauty. This extraordinary latest design will make it superhit on this Diwali..